← I’m a Winner of $50 Amazon Gift Card! I live in Toronto, born and bred. I also run my blog, which is an eclectic mash of memoir stories, articles about writing and self-publishing, book reviews, author interviews, and my occasional rant on injustices I come across. I’m also part of the Sisters of the Fey blog with 7 other authors where we share our views and knowledge about the spirituaI realm. I’m an empath and believe in angels. I also write a travel column for Sally Cronin’s Smorgasbord Invitation. I probably should have been an investigative journalist because I’m a great sleuth when it comes to research. But I’m afraid I missed the boat on that one. I loveeeee to travel and socialize. And you’ll always find me fighting for the underdog. Jjspina: You are an amazing woman, Debby. Out of the ashes you rose triumphant and better than ever. Now that’s a good question. I’m not sure I ever really aspired to be an author. A writer yes, as I’ve been writing since childhood, but an author was a far away dream for me. In my twenties, I began devouring books and only wondered if I’d ever gain the courage to write a book. But the years and decades passed. I wrote in journals to document the craziness in my life and later submitted a few articles to some local magazines. As my journals grew through the years and my emotional battle with my mother escalated, I began to feel the need to compile some of my stories and so I wrote my first book. 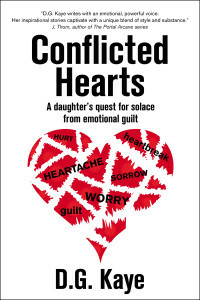 Conflicted Hearts – a memoir about how growing up with a narcissistic mother affected my childhood right through to adulthood. Jjspina: It was a good thing that you did document your life. It made a fantastic book and must have been cathartic for you to release all that angst. I think I’ve been lucky in that department because I’ve never really sat down and said, “Okay, I want to write a book, what should I write about?” Often, I’ll be doing something unrelated to writing when I get an inspiration to write on a topic. My first book, Conflicted Hearts, I knew was going to be written from the journals I kept. My 5th book I published – P.S. I Forgive You, I knew I had to write that somewhat of a sequel to an unfinished story of Conflicted Hearts, but I also knew I couldn’t write that book until my mother died. I began writing it only a few months before she died as I struggled with breaking ‘no contact’ after 7 years of finally breaking free from her hold on me. My 3rd book. 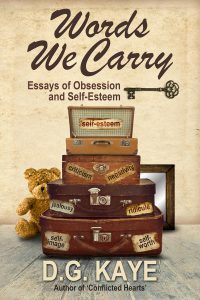 Words We Carry, is a nonfiction/memoir. I often write in a crossover of both. In that book I share stories about building self-esteem and talk about healthy and toxic relationships. Menowhat? A Memoir was sparked by one silly night of joking around with my bestie as we compared notes on how menopause was wreaking havoc on all our body parts. We were laughing hysterically as each of us tried to one-up each other with hilarious scenarios about who had it worse. I summed up our conversation by saying, “You can’t even make this shyteup” and decided I should write about it. Ladies who have ‘been there, done that’ can relate, and hopefully find the humor in it. Surprisingly, that book gained quite a few male readers who were curious to learn what their partner’s craziness was all about. LOL. 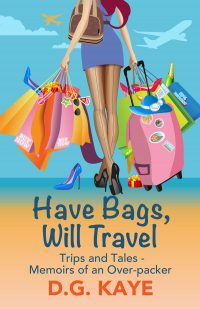 My book, Have Bags, Will Travel, was a fun write recounting some of my more humorous escapes and learning lessons on travel. 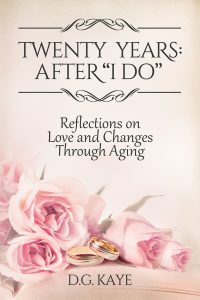 And my latest book, Twenty Years: After “I Do” was inspired by my wanting to write a tribute to my marriage on how to keep a marriage alive and thriving when life throws curve balls. jjspina: You have some powerful books, Debby. I look forward to reading your latest one. It coming up on my TBR list soon. Since I began publishing, I’ve put out 1-2 books a year, but last year was a chaotic year right up until this past winter. I told myself I wanted to take a year off from book writing. I had lost my book writing mojo temporarily, but thankfully, it’s come back to me recently. Currently, I’m ‘turtling’ along with my next book, inspired by another conversation with a friend about how menopause has sentenced some of our parts to becoming almost unrecognizable after it’s done with us. Again, I’m aiming for humor with many relatable issues, lol. Hey, what can we do right? Sometimes you just gotta laugh! I’m nowhere near finished writing that book but the title is clear – The Change After the Change. Jjspina: I’m sure it will be fabulous as all the others. That’s an interesting question, Janice. Initially, I thought I was writing for a mature female audience. As it turned out. It seems many younger women enjoy my books and surprisingly, quite a few males. I admit, writing personal things about ‘women parts’ was intimidating for me after discovering that men were reading my books too. But I was enlightened by this and happy to learn that men wanted to try and understand what women went through with the mystifying menopause and are also eager to learn more about relationship issues from reading my books. Jjspina: I hope those male readers learned something helpful in understanding women. Lol! Write for the love of writing. Write because it’s your passion. Don’t go into publishing thinking your book is going to be a bestseller and you’re going to get rich because it probably won’t and you probably won’t. Write and build a platform of followers and readers by opening a blog and engaging with readers. Post engaging articles on your blogs and on social media. Build your tribe and have them waiting and wanting to read that first book you publish, and then continue writing and engaging. If we have any aspirations of fame or fortune, with a little luck and a lot of social interaction, we can establish a presence for both – ourselves and our books. I could think of many wishes, but my only wish is for good health. Without it absolutely nothing else would matter. All the money in the world cannot buy health. Jjspina: That is so true, Debby. I wish that for you, my friend. I can’t even imagine life without writing. I’ve been writing since I was 6 years old. I suppose if I couldn’t write I’d probably be blabbing a lot more and spending way more money on socializing and shopping (my weakness). The extrovert in me thrives on communication so if I can’t write, I’m going to tell you what’s in my head anyway. Jjspina: I believe you would be productive either way. Lol! It was my pleasure, Debby. I enjoyed learning more about you and your fabulous books. After struggling for decades to break free, Kaye has severed the unhealthy ties that bound her to her dominating mother—but now Kaye battles new confliction, as the guilt she harbors over her decision only increases as the end of her mother’s life draws near. From PMS to menopause to what the hell? Join D.G. 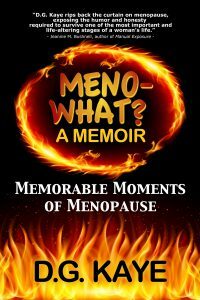 on her meno-journey to slay the dragons of menopause as she tries to hold on to her sanity, memory, hair, and so much more. In her quest to keep from tipping the scales, D.G. strives to devise new tricks to fit everything in her suitcases on each trip. Why is she consistently a target for Canada customs on her return journeys? Come join our Literary Diva’s Library Facebook group for writers and authors. I read a few of D.G. Kaye’s books and thoroughly enjoyed them. Here are two of my reviews. A Heart-wrenching Decision to Forgive! P.S. 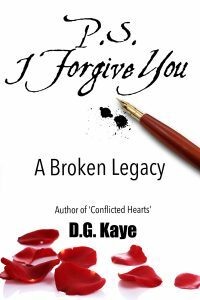 I Forgive You: A Broken Legacy is a journal of a rollercoaster of emotions displayed by this author as she deals with a narcissistic mother. This is a journey through life to survive without love and care from a mother who was incapable of loving anyone but herself. The author opens her heart to the reader as her emotions pour out. She does all she can to make amends but to no avail and is forced to forgive her unfeeling mother and repair the damage done to her and her siblings. This book is a catharsis to anyone who has had to live with this kind of parent. It helps them deal with the myriad of emotions that continue to bubble up inside and threaten to suffocate oneself. My heart goes out to this child and her siblings who somehow managed to be strong and resilient even though they were never taught the essentials of parenting and the love that is needed to bring up a child. The author has shown remarkable strength and courage to face head-on the torments that continually threaten her very soul. I recommend this book to anyone who has yet to feel closure from an unhealthy relationship. A Story of Courage and Resilience! Conflicted Hearts is a story of an amazing woman who had to endure hardships throughout her life beginning with a heartless mother. As a young child she learned how to survive and make her way without her mother’s love. This author poured out her heart in a cathartic way in order to deal with telling her story. She has faced adversity, serious illness both herself and her husband’s and somehow came out stronger. Reading this book has been an eye opener for me. We all have to deal with our own demons and disappointments in life but it is how we handle them and come out on top, stronger and more resilient is what matters. I would highly recommend this book! Thank you, readers, for stopping by to read about this talented author. Please check out her fabulous books on the above links and follow her on social media. Reading is good for your health! Please leave a little love for authors by reviewing their books wherever you purchased their books. We authors will love you back! This entry was posted in author interview, Author Interviews, books, D.G. Kaye, memoir author, Memoirs, Reading, Writing, book reviews and publishing, poetry, children's books, YA and novels and tagged author interview, Book review, books, D.G. Kaye, Memoirs. Bookmark the permalink. 187 Responses to Interview with Author D.G. Kaye! 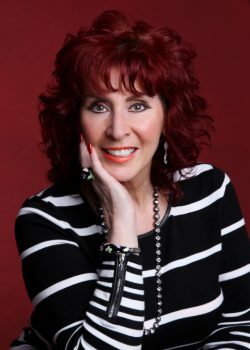 Debby’s books are always entertaining and written with true insight. The menopause book was indeed hilarious, but funnily enough I feel so much better being post menopausal than I ever did beforehand! Or just give up and don’t function with them at all? It’s learning how to accept what is non-functioning that makes all the difference. I used to be terrified of the menopause arriving. Now I realise I’m still the same person, I haven’t aged overnight, and actually feel tonnes better in lots of ways. Yeah, there’s a few problems I didn’t have before, but I really don’t care. There is some, if you look hard enough! If you haven’t read any of D.G Kaye’s non-fiction/memoir books, now is the time to do so! She writes with true insight into issues such as family relationships, menopause, and marriage. Debby is an amazing individual and author!! She tackles subjects many of us would shy away from. This is a great interview. All the best, Debby and Janice! 🙂 They need to know! Thank you, Bette. 🤗 😘 I’m sure Debby will be happy to hear that. Have a great week, Janice! Hi Debby! It is a pleasure to be here. ❤ I'll be writing a review very soon. I enjoyed your book very much. Nice questions Janice and Deb is such an expert in answering! I admire her spontaneity and courage. Stay blessed ladies. It was fascinating to read more about Debbie through Jan. She-s had quite a life, and entertained many by its telling! More power to you both! Thank you. Fascinating interview and so interesting on many fronts. Know all about narcissistic personalities and the havoc they wreak. Good for you to rise up and move on. Tweeted and shared on Facebook. Good luck. Thanks Janice. Good interview, Deb! And it sounds like a great upcoming book. I have to agree–that change brought so many changes! So I’ve heard. But when? Oh when? Lol. A lovely interview, Janice and Debby. I really agree with Debby’s comments about good health. You can’t buy it and life is very compromised without it. You are welcome, Janice. I would love to be on your blog, and I emailed you earlier today. Many thanks! Really enjoyed this interview, Janice. Debby’s books are on my radar, I need to make more reading time! Mind if I ask who does your fabulous covers, I love them! I’ll keep that in mind, Janice. I really enjoyed your interview. Very nice and says how much you are worth as a writer. With your answers you learn to value when you want to write. Finding your blog has been a hit. Greetings and follow the successes with your books. Undoubtedly, that is how it will be. I just love your love of life, Debby. It doesn’t matter what you seem to be going through, your love of life always shines through. You’re such a positive person and this, in turn, rubs off on anyone you come into contact with. I only wish you were my next door neighbour. It’s people like you in the writing world, that makes it such a great place to be. Thanks for asking the questions, Janice. You’ve got yourself a great scoop with this interview. This is a great interview, Janice. I enjoy reading Debby’s work. So good to get to know more about Debby. She writes with such humour, insight, and compassion.